Kastel's Grand Galaxy Win is a very modern stallion by the KWPN stallion, Apache who is very successful in international Grand Prix under Emmelie Scholtens. 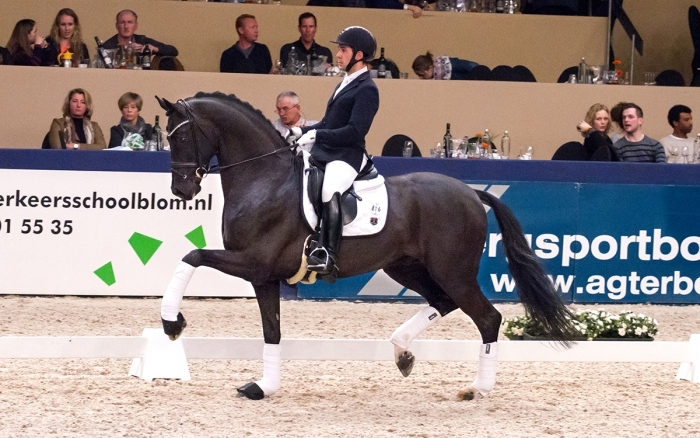 In 2014, Kastel's Grand Galaxy Win was awarded champion stallion in Danish Warmblood. In 2015 he was second in the Danish championship for 4-year-old and in 2016 he was in the final at the world championship for young horses. With his expressive look, powerful movements and with convincing willingness to work, he has all what you’d ask from a modern dressage stallion. Kastel's Grand Galaxy Win is by the Grand Prix stallion, Apache who had six sons selected for the KWPN licensing from his first crop, which already at that time made him an interesting sire stallion. The dam to Kastel's Grand Galaxy is the elite mare Winner T, who is by the Grand Prix stallion and breeding magnate Jazz, and therefore, a full sister to the Prix St. Georges horse, Volvo. In the third generation, you find the well-reputed Zeolit, the sire of numerous Grand Prix offspring, e.g. Gomerant, Oscar B and Lawoel. The beautiful expression and the powerful movements easily identifies the offspring by Grand Galaxy Win. From the first crop by Grand Galaxy Win, he had eight sons selected for the Danish Warmblood licensing 2018, where three sons were approved and one of them was premium stallion. Grand Galaxy Win also sires the 2018 Oldenburger champion stallion, Global Player (GGW / Don Schufro) who is a part of the Helgstrand and Schockemöhle stallion 2019 collection. Grand Galaxy is licensed in DWB, OLD, HANN, KWPN, WESTPH, Süddt. Verbände, Mecklenburg, Rheinland. Galaxy is stationed at Helgstrand Dressage.